So I’ve been wanting to bake something more fruity ever since I made the carrot cake last week. I do love all the chocolatey things and cakes and all the good stuff. 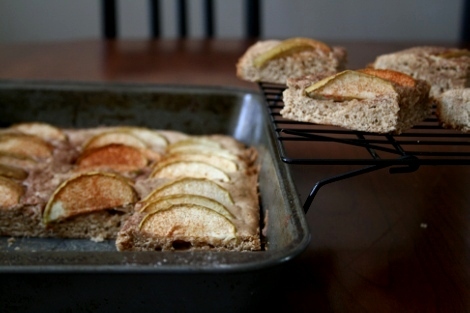 But lately i’ve been wanting to bake something with apples, that seems a little lighter and healthier. (ok, i know it’s not exactly healthy.. eating an apple on it’s own would be a lot better, which I have been doing also!) But I had wanted to use up some green apples that were sitting on the counter. Of course I searched for recipes on the web, and in Dorie’s Book to find an apple related recipe that was lighter and less dense than say, an apple pie. So I stumbled upon this recipe, and decided to combine it with a recipe I found in Dorie’s book for Dimply Plum Cake. I really liked her’s but found It was a bit smaller than I wanted to make so I combined the two recipes to make something inbetween. Instead of chopping the apples up and incorporating them, I sliced them and layed them on top of the cake like Dorie’s plum cake. This recipe is worth trying for sure. Preheat oven to 350 degrees and spay a 9×13 baking pan, dust with flour and tap excess off. 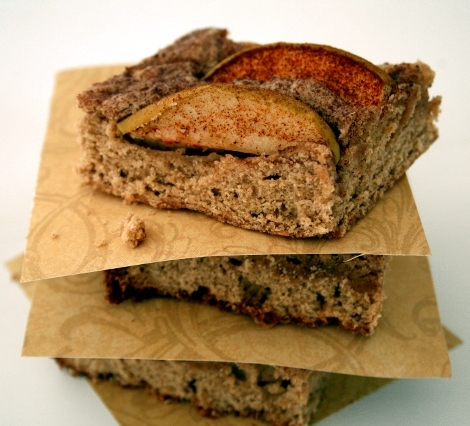 In medium bowl, combine flour, baking powder, all spice, cinnamon and nutmeg. Whisk to combine well and set aside. In bowl of stand mixer, combine sugars and butter and beat on medium high until light and fluffy, about 1 minute. Add eggs, one at a time, beating well to combine. Add vanilla extract and beat to combine. Turn mixer on slow and fold in flour mixture a little at a time until just combined. Spread mixture evenly into prepared pan. 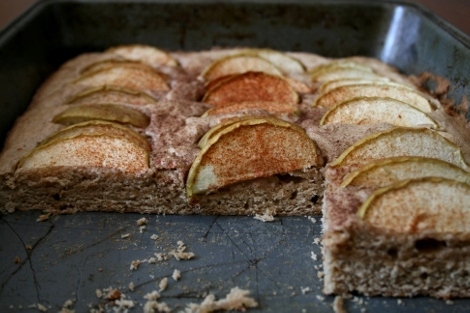 Layer top with apple slices so they all face the same way, and sprinkle top generously with cinnamon sugar. Place in oven and bake until cooked through, when top slightly bounces back to the touch, about 30 minutes, you may need an extra 5 minutes if it looks too soft, so just turn the oven off, and let them sit for another 5 minutes before you take them out. Remove from oven and let cool completely before removing from pan, cutting and serving. These would also be good with whipped cream, cool whip or a dollop of ice cream. Yumm. I love the rustic look which is something my family loves in baked goods. 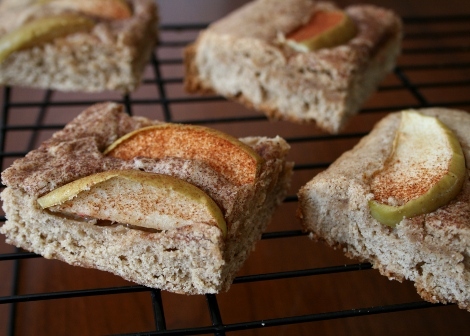 Those cinnamon-speckled apples look amazingly good! I bet this would make a great breakfast. This looks like a perfect recipe for fall. I will add it to my list of recipes to try. Do you know how many calories are in this?